We orignially posted this while traveling full-time and living 99% off of savings. Some things have changed and we have updated this post with the changes. New information after nearly a year of travel will be in italics. We did it! 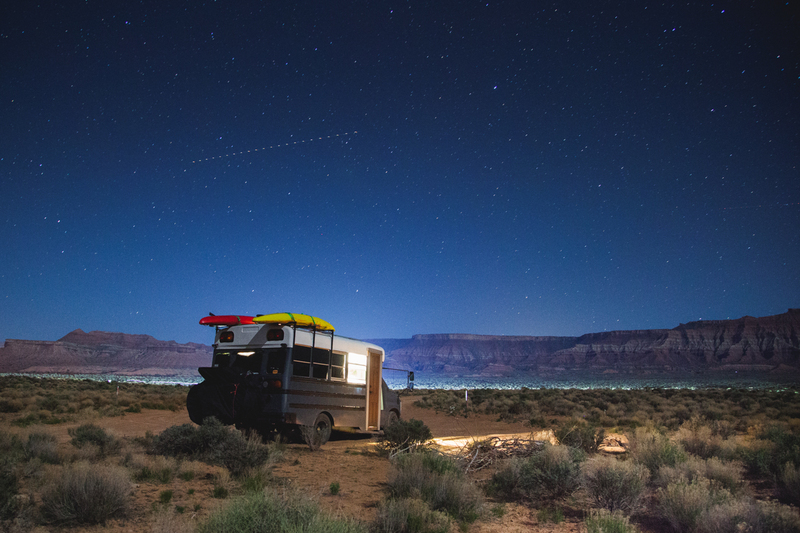 We quit our desk jobs and took off across the country in our converted school bus. 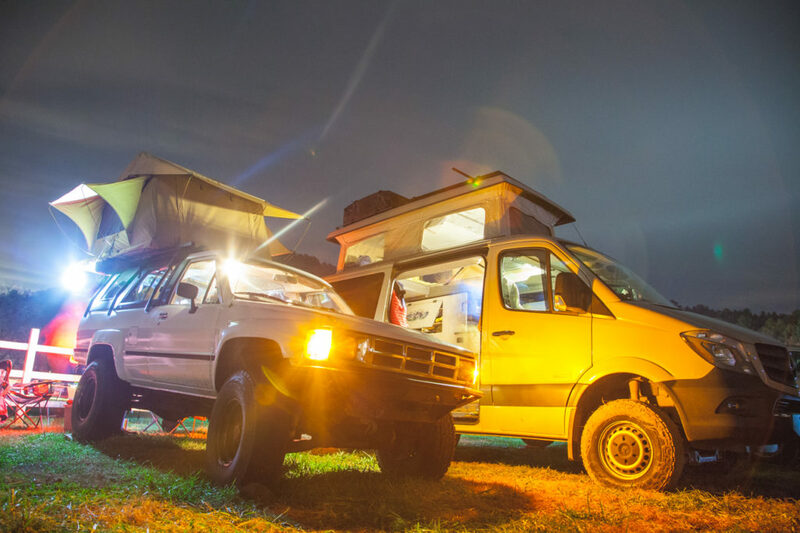 A nomadic lifestyle has proven to be tricky and challenging in all sorts of ways and we have tried to document how we made the switch from full-time, white picket fence, 9-5’ers to full-time, skoolie living, nomads! Rachael worked with the local university in the business office taking care of students that needed financial guidance to remain enrolled and in good standing with the university. She really thrives in an environment where she can help people every day and use her exceptional customer service skills. I worked in a similar field, managing the accounting and compliance for a job training center that works with at risk youth. I never particularly cared for the work, but getting to interact with young people and trying to make a difference in their lives was meaningful enough to stay there for 4 years. However, as of March 15th, 2018 we were unemployed and shortly thereafter, became houseless. See, a big component of this plan was to make sure that we could liquidate the assets or liabilities that were holding us in one place and the biggest asset that we owned as a couple was our home. I purchased a house several years ago and had always planned on upgrading it and flipping it or turning it into a rental property. Fast forward to now and the house is rented to a lovely couple and the rent amount more than covers the mortgage and repairs. After you have sold a lot of the little things that you don’t enjoy, move on the big stuff. In 2015, I purchased a two year old Honda Accord that was cleaner, faster, and nicer than anything I had ever owned. I loved that car. I loved the efficiency and status that came with having a nice car. However, I quickly realized that the price tag was not worth the comfort. We sold the car and Rachael’s pickup truck and are now a one vehicle family, a bus! Not having a car payment and having dirt cheap insurance is one of the most freeing feelings that I have ever felt. Another big ticket item that needed to go was my project 4×4. This was the first car that I purchased outright after completing college and there was a ton of sentimental value attached to it. 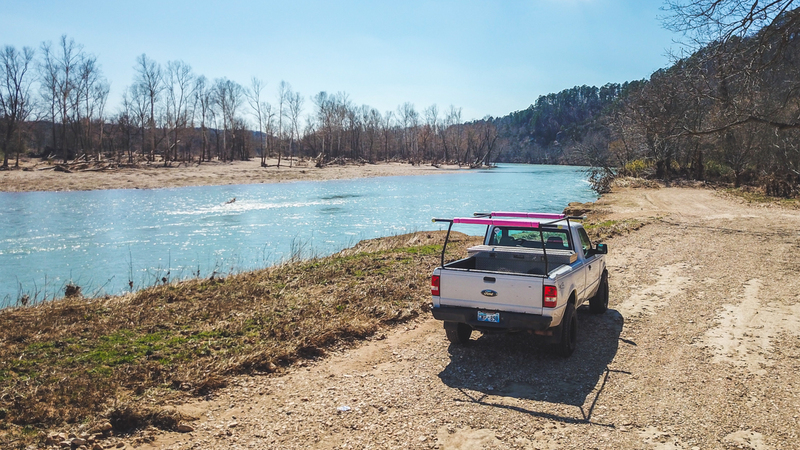 It had been on many adventures and hauled most of the gear that I owned to the trailhead or the riverside. It had issues however, and cost several thousand dollars to get it running after the head gasket blew a couple of years back. Once repaired, we sold it and cut our losses. Keep in mind that you will rarely make back the amount of money invested in a project car. 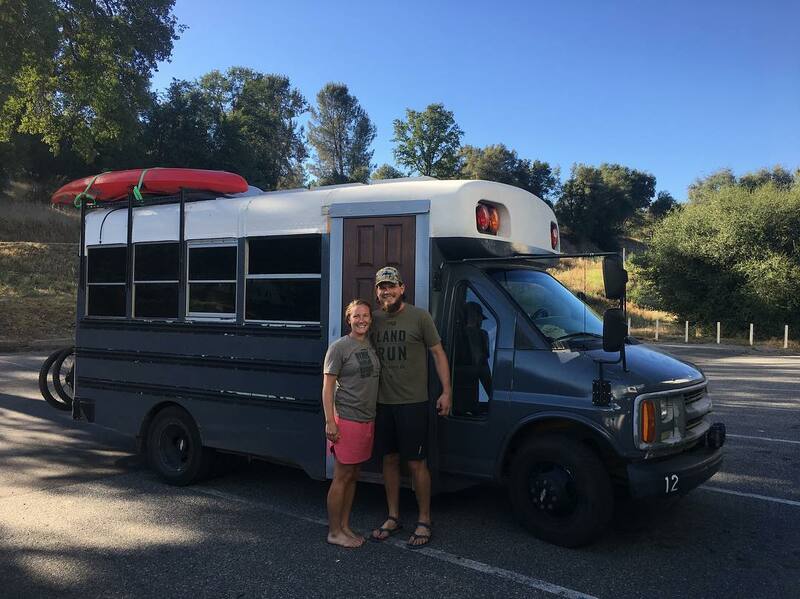 Our bus is a 2000 Chevy that had 107,000 miles on it when we started the build process, which would lead one to expect a relatively trouble free 20,000 miles or so traveling around the country. Well in four months we have had to replace the brake pads on the front and rear as well as the rear axle oil seal ($700), replaced the Pump Manual Drive ($300), and replaced a broken bike rack ($500) and a bent DIY trailer hitch ($250). Since then, we have spent another couple of hundred dollars on miscellaneous parts such as fuel filters, fuel pump, and a serpentine belt. All are regular maintenance items that would come up during the regular course of ownership. 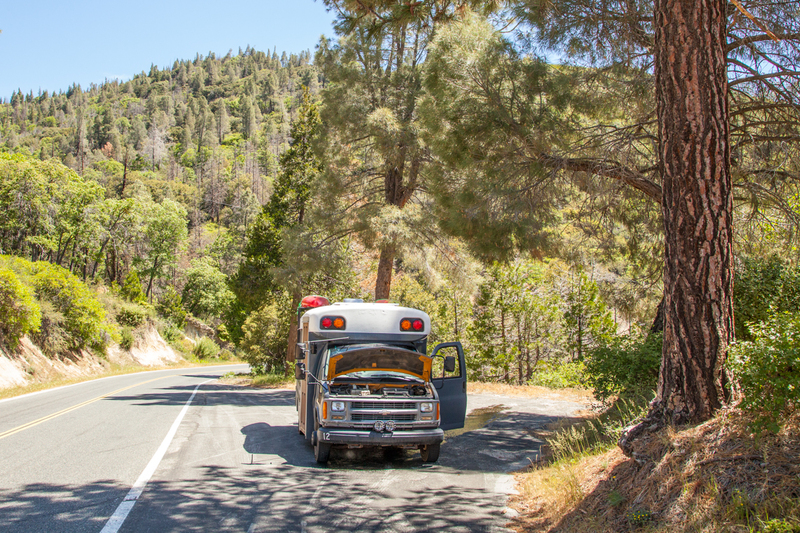 If you are planning to travel the country and rack up hard miles on your school bus or van, consider having a pot set aside for repairs and new parts. It helps to be able to replace parts and do some of the work yourself, but count on having to pay a shop to do more of the heavy duty jobs. If you are still working on your bus, start using your “full-time” budget as soon as possible even if you are living in the driveway. Accustom yourself to not getting the $5 cup of coffee and start conditioning yourself to ride your bike to work when your weekly fuel budget is spent. We have continued to use this philosophy as we find housesitting gigs around North America. We use the time to recharge, save some more money, and see a new area more intimately. Likewise, we still live like we are in the bus even though we are in a big house in a beautiful location. This keeps costs relatively stable and sometimes it’s much cheaper. The only way that a full-time nomadic lifestyle was possible for us was through savings. We began early in our relationship with a fair amount saved up already and once we were married we were able to reduce our expenses and save a lot of our expendable cash for travel. What happens when you run out of money? What if your freelance gigs dry up? What do you do if your company doesn’t want to pay you to work remotely any more? Be smart and have a pot of money sitting aside, ideally in a fluid investment (think high-yield savings account), and be prepared to settle down somewhere for a while until you have enough money saved up to have another go at it. At minimum you will need some money to park your rig and job hunt in a new area. Don’t be caught off-guard by not being prepared. Where do you want to go on your next adventure? Knowing where you are going will make plans much easier while you travel. For example, we want to eventually travel the Baja Peninsula, so we are making plans to brush up on our Spanish and reach out to businesses that hire ex-pats in the Baja area for work over the winter. Most organizations and businesses don’t look for last minute employees. Reach out and make connections before they are needed. If you are making income while traveling, consider setting aside $25-$50/month to your “Baja Fund” and keep it separate from your other savings. This will allow you to save toward a goal and have a good chunk of cash to start from when you are ready to make the jump again. The longer you spend working on this lifestyle, the quicker you will learn what you need or don’t need in a given week. For example, we have found that we can wear a shirt a few times before it starts to smell (and that’s why we do laundry right?). We have also found that if we aren’t working up a sweat, we can skip a shower for a couple of days. 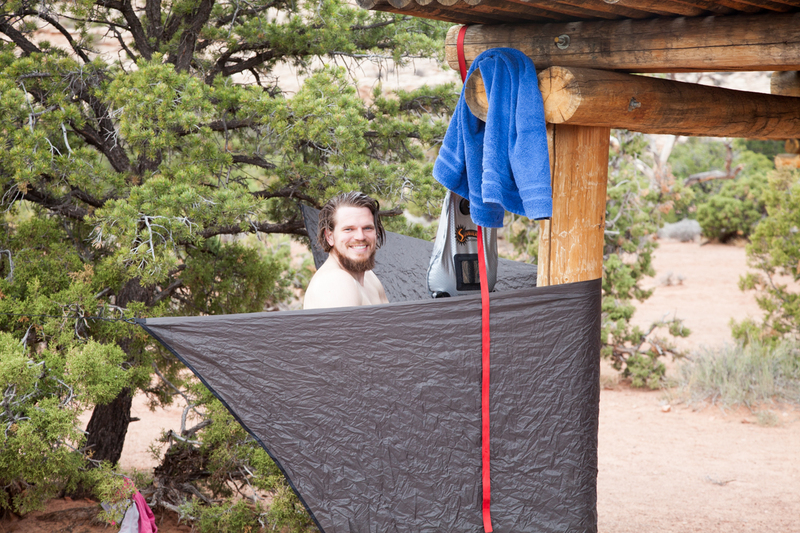 Our camp shower gets used regularly for “rinse offs”. One of the most obvious ways that we have embraced the “bus life” is through using objects for more than one purpose. Recently we bought a huge tray of strawberries at the market and after we were finished, turned the container into a box for our granola bars in the cabinet. For more ideas on reducing your environmental impact while living a nomadic life or a normal 9-5 life, check out our article HERE! While we traveled the U.S. in 2018, we tried to pick up odd-jobs along the way that could supplement our budget a bit and allow us to experience new things. From working as parking attendants for a massive music festival to shooting residential drone footage in Idaho, there are options out there to make a little side money to keep going. A lot of folks that we have met on the road have a side hustle like selling essential oils or making handcrafted goods that they sell online. Other folks that we have met maintain real jobs from their vehicles. One of our friends works for a non-profit full-time from his sprinter conversion which allows his wife to pursue her dreams of becoming a nutrition expert. In September, we reached out to a group that we had volunteered with earlier in the year about volunteering with them again. When we chatted with them, we were suprised that they offered us part time jobs working remotely. We are able to set our own hours within reason, collaborate with people on our team all across the U.S. and save up for more travel. Can you say Alaska 2020? Are you living life on the road as a nomad? If so, how did you do it? We would love to hear from anyone that has found other ways to make it on the road and avoid the 9-5 at all costs! Follow us on social media platforms likeYouTube, Facebook, and Instagram. The more viewers, subscribers, likes and comments, the better our pages rank. Hello. I’ve written this reply once before, but wasn’t certain it went through. I’m looking for a job, and have to have insurance benefits. I wondered if you found a way to get health insurance without having to have a job that provided part of the benefits. I’m open to any suggestions. I’ve always used my husband’s work insurance, but he’s going to go to Medicare with a supplement in December, and I’ll be on my own to find an insurance for myself until I reach 65. You are both young and healthy, so maybe there is not the need for insurance at your age. Thank you for your consideration of this question. Thanks for the comment and question! Our insurance is a little different than most that are traveling full-time. Rachael is utilizing the Marketplace (Affordable Care Act/ObamaCare) while it is still around. We will likely have to change her coverage in 2019 as the new administration has ushered in some “catastrophic only” coverage options that will meet our needs for Rachael’s coverage. I am a Cherokee citizen and so I am exempt from penalty on taxes for not having insurance. I am able to utilize Indian Health Services clinics around the country for basic care and emergencies. I hope that answers your question and I hope it shines some light for your circumstances. Sounds good! Stop by and say hello!